Vitamin D is a fat-soluble vitamin which can be naturally found in a few foods, can be added to others through fortification and is also available as a dietary supplement. It is present in two forms, ergocalciferol (Vitamin D2) and cholecalciferol (Vitamin D3). 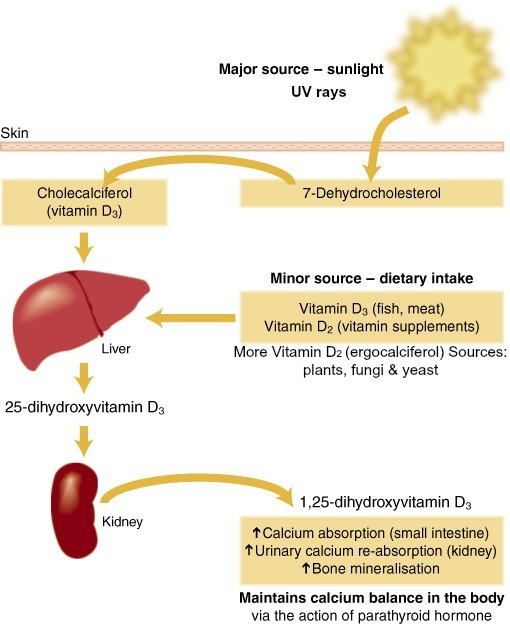 Vitamin D3 is produced from the conversation of 7-dehydrocholesterol in the skin after exposure to ultraviolet rays which trigger its synthesis. In order to be activated vitamin D must undergo two hydroxylation reactions within the body. The first takes place in the liver, converting Vitamin D to 25(OH)D, or calcidiol. The second reaction occurs mainly in the kidneys as well as in other organs such as lymph glands and skin tissue, resulting in the formation of 1,25(OH)2D, also known as calcitriol. This is essentially the final, activated form of vitamin D, ready to now perform its functions. Vitamin D is a vital part of good health. It is required for the maintenance of strong bones as it regulates metabolism of calcium and phosphorus as well as absorption of calcium from the gut and kidneys. Even if you eat a lot of foods rich in those minerals without vitamin D you can’t absorb them into your body. The vitamin is needed for bone growth and remodeling by osteoblasts and osteoclasts. Vitamin D sufficiency can prevent rickets in children as well as osteoporosis (weak bones) and osteomalacia (bone pain) in adults. Without a sufficient amount of vitamin D in the body bones will become thin or brittle. Other roles of vitamin D include modulation of cell growth, neuromuscular and immune function, as well as reduction of inflammation. Research has also shown that Vitamin D can improve a number of brain disorders, including depression and dementia. Moreover, there is a positive correlation between the presence of this vitamin in the body and an improved cardiovascular health (healthy heart and blood pressure), respiratory system (healthy lungs and airways) and possible protection against a number of different cancers (breast, ovarian, prostate and colon) and other diseases such as type 2 diabetes, multiple sclerosis and tuberculosis. The RI values have been provided by the Food and Nutrition Board (FNB) at the Institute of Medicine of The National Academics (2010). Recommended Dietary Allowance (RDA) is the average daily level of intake sufficient to meet the nutrient requirements of nearly all (97%–98%) healthy people. If you choose to go for vitamin D supplements remember to also take vitamin K2, which helps to move calcium in the specific areas of your body where it is needed such as the bones and teeth. Vitamin K2 also helps to remove calcium deposits from areas where it shouldn’t be, such as the arteries and soft tissues. Taking both vitamin D and K will contribute towards strengthening of your bones and improved heart health (as deficiency in vitamin K can result in calcification leading to hardening of the arteries). While supplementing ensure you are not deficient in other vitamins and minerals such as vitamin A or magnesium as these can all have an impact on your overall health and the effect of vitamin D.
For more about vitamin D supplementation click here. 1. Institute of Medicine, Food and Nutrition Board. 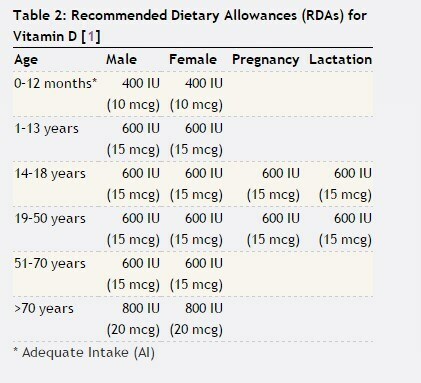 Dietary Reference Intakes for Calcium and Vitamin D. Washington, DC: National Academy Press, 2010. Reblogged this on Mariposaoro's Blog.